ESPNcricinfo – Dale Steyn had bided his time while South Africa built a position of supremacy against West Indies, but when he stirred the effect was lethal. West Indies were blown away within 15.3 overs, their last seven wickets falling for 55 runs. It was a feeding frenzy and Steyn was the central figure, licking his lips over a morning spell of six for 31 in seven overs. What ails West Indies? Are the Caribbean islands so locked into an instant world that they no longer have the wherewithal to play Test cricket? A Test between the sides ranked No 1 and 8 in the world always had the potential for a mismatch, and South Africa’s victory by an innings and 220 runs – a win achieved by playing efficient but by no means unstoppable cricket – illustrated just as much. Steyn had not taken a wicket in the first innings; he groused at a niggle or two when South Africa imposed the follow-on and left the field for most of the third evening, only bowling five deliveries. But South Africa were blasé about talk of injury. A good night’s rest sustained him. He beat Leon Johnson’s outside edge with the last ball of his first over, had him caught at the wicket with a rising delivery at the start of his third over and from that point restated his reputation as one of the finest fast bowlers in the history of the game. Steyn against Chanderpaul promised a contest. Chanderpaul squeezed a boundary through third slip and gully, squared up in the stroke. The crab sensed the tide was rushing out. Steyn banged one in short and Chanderpaul stooped into a ball that did not rise as much as he anticipated. AB de Villiers, deputising behind the stumps for the injured Quinton de Kock, who is out for the rest of the series, completed an easy catch. Steyn was now all malevolence. Even with only four wickets down, the suspicion was that the Test might be over with indecent haste. Steyn’s removal of Marlon Samuels in his next over was even nastier. Samuels’ intention was to work him to the leg side but the ball bounced more from a good length and as Samuels flinched back the ball arced gently off a leading edge to cover. The Centurion pitch, which had behaved impeccably on the first three days, was by now standing in Steyn’s corner. And so it went on. The captain, Denesh Ramdin, lasted two balls. He pushed blindly at the first and gained a boundary through point that he knew he did not deserve. Steyn responded with a short one, as if offended, and as the ball flew off the shoulder of the bat, de Villiers sprung in front of Amla at first slip to take the catch. 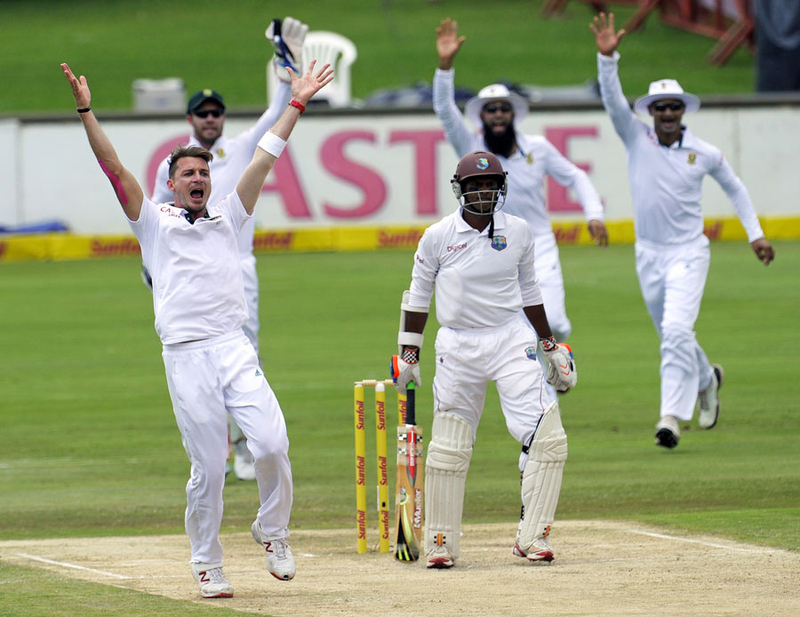 When Steyn is in this mood, expectation makes men giants in the close-catching cordon. The overs at the other end, whether propelled by Vernon Philander or Morne Morkel, had merely seemed back-up entertainment while Steyn rested. It felt like an error in the programme when Steyn went an over without a wicket, even more so when Morkel intervened, jagging one back at Jermaine Blackwood. His bottom hand flew off the handle – the West Indies looked spooked – and from the released glove the substitute, Temba Bavuma, took a good catch at short leg. With Kemar Roach not batting, South Africa only needed two more wickets. That they would be taken quickly was never in doubt. Steyn’s fifth was a regulation catch at first slip; his sixth another leading edge – Jerome Taylor and Sheldon Cottrell two tail-enders out of their depth. Somewhere amid the final throes, Sulieman Benn managed a faint riposte by whacking Morkel through midwicket. But the presentation platform was hauled out with lunch still 70 minutes away. West Indies had been dismissed twice in four sessions. In Brisbane, a proper Test series was enthralling crowds, India ultimately overpowered at The Gabba. Elsewhere in Australia, the Big Bash was providing more instant gratification. In South Africa, the No 1 Test side felt itself all-powerful as an emphatic victory was completed. It no doubt felt gratifying. But it was best not to analyse it too deeply, even allowing for the classical sight of Dale Steyn sniffing the muggy Centurion air in anticipation of the easy pickings to come. Scores: South Africa 552 for 5 dec (Amla 208, de Villiers 152, van Zyl 101*) beat West Indies 201 (Smith 35, Philander 4-29) and 131 (Steyn 6-34) by an innings and 220 runs.